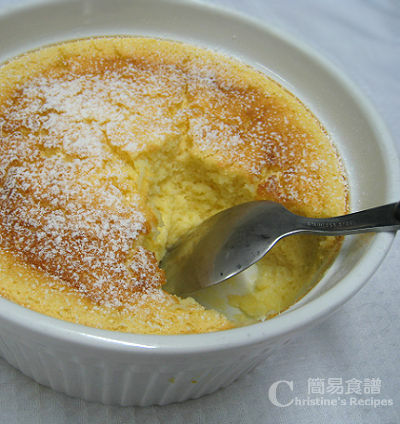 I have translated some of the recipes here and posted on my another food blog, Christine's Recipes. Feel free to hop over there and take a look. Christine, thanks for this recipe! I tried it yesterday and it was delicious despite it was still a bit watery on the bottom!!! My oven is probably too strong too, I set it as 365F and I baked for about 20 mins and it was already pretty burnt on the top. So I turned the temp down and took it out a bit sooner but it was watery on the bottom... actually the portion that was watery was the part where it was emerged in the water... so I wonder if I shouldn't have them sit in the water bath next time? Or what do you think the problem may be? In any case, my husband loves it and the two of us ate the whole thing! 今天買齊了工具, 明日弄, 再請教一下, 點先知得未, 因為見你的文章, 蛋糕可以放支針去試, pudding用同一方法又唔知得唔得? 你好, 還有一個問題, 閣下的food processor是link中的這種, 還是我們廣東話的攪拌器? 想問下你平時用既mixer 係stand mixer 定係hand mixer? 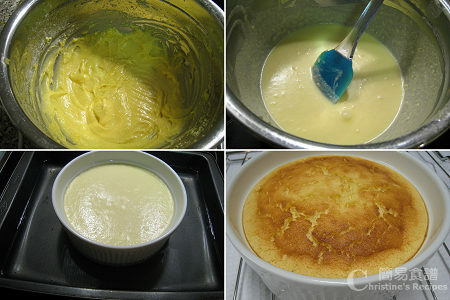 但無論我用咩mixer (i have both)... 整咩野cake or quick bread 出黎d texture 都係好tough.. 點樣可以fold in flour 時唔會好大力呢? I have a question about the hot water.. so it gonna mixed with hot water before i put in to oven? Thanks. Are you talking about the hot water in the baking tray? No, the hot water won't mix with anything. Just let your ramekins (with custard inside) sit in it, like a "hot bath".